It’s crucial to update your website as your brand develops and grows. Get Wet Store came to Ready Artwork looking to redesign their logo. They were so satisfied with the work our designers did for the logo that they came back to get their website redesigned as well. Get Wet Store is an online e-commerce store that sells scuba and snorkeling equipment. Their existing website was very plain, outdated, and not responsive. 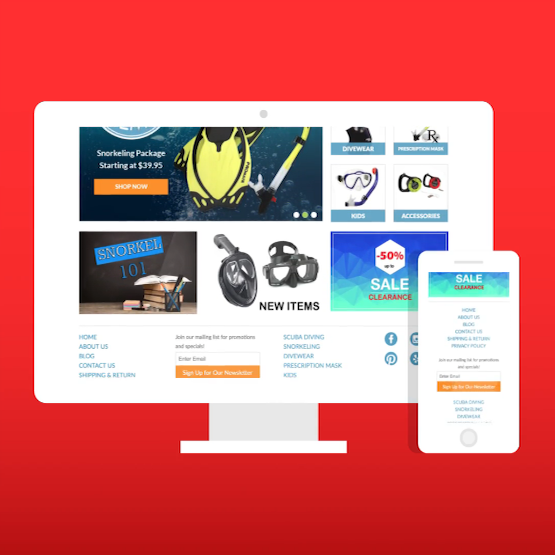 Our team focused heavily on creating a user friendly and clean e-commerce store. The website is responsive, has a one page checkout, includes an email newsletter popup and a product zoom cloud over every photo. Our developers also created a custom dropdown menu for prescription snorkel masks for customers to choose different prescription for each eye. A new logo does allow customers to dive deeply into your brand but if your website doesn’t match then your customers may not realize your company’s full capabilities or may not even trust you. So let our team create a website fit for your business, contact our team of Magento certified developers and experienced designers today!